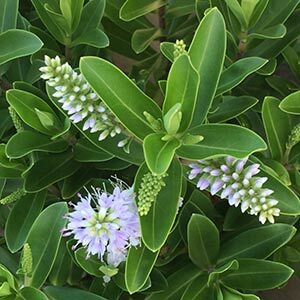 If you are looking for an easy care, fast growing shrub, Hebe ‘Wiri Image’ could be one to consider. Both in new gardens and older established area this is an excellent plant with year round interest. With pale lilac to violet coloured flowers and mid to dark green foliage Hebe ‘Wiri Image’ provides a cool soft look to the garden in summer. Although the main flowering period is in summer Hebe ‘Wiri Image’ will spot flower through the year depending on the position and climate. Flowers appear as small spikes, white when in bud turning to the soft lilac as they open. Excellent in the general garden border, or grown as a low hedge. Hebe ‘Wiri Image’ is also well suited to growing in containers. The softness of the flower foliage combination lend Hebe ‘Wiri Image’ to mass planting. Excellent for underplanting climbing plants such as clematis as well as for planting in front of taller screening plants to soften the look. This is a naturally bushy plant and if lightly pruned after flowering will require little extra care. Best planted in a humus rich soil with some extra well rotted compost added before planting. Flower Colour – Pale Lilac to Violet. Leaf – Mid to dark green. Flowering Period – Summer with spot flowers through the year. Hebe ‘Wiri Image’ is available for sale from the following participating nurseries.